As diverse as director Kasi Lemmons’s impressive yet varied filmography has been since the actress turned filmmaker burst onto the scene with the masterful indie Eve’s Bayou (which she later followed up with the misunderstood, ambitious yet uneven Caveman’s Valentine and the terrific underrated Don Cheadle starring Talk To Me), Lemmons has always been attracted to tales of complicated family relationships. Usually centered on a fractured dynamic between father and child (with a particular focus on father/daughter dramatics), it’s no wonder that Lemmons has stated that her favorite film is Denmark’s debut Dogme 95 dramedy feature The Celebration from director Thomas Vinterberg, in which grown children square off against their abusive patriarch. Yet as drawn as she is to the heavy-hitting tales of domestic woe, Lemmons also has a strong appreciation for the power of music to convey what words cannot – similar to the way she uses the tools at her disposal via her cinematographer’s camera and editing eye to tell a story in a multitude of ways that require multiple senses to understand. To this end, she confessed to NPR that the Fox Searchlight distributed Once from director John Carney is the one film she could watch a million times. And what better place to merge her love of music with the topical themes that fuel her work than Fox Searchlight, where she spent nearly six years working to get her own adaptation of poet turned playwright Langston Hughes’s holiday themed gospel pageant production Black Nativity to the big screen. 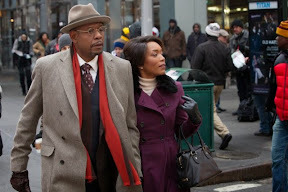 A stellar achievement due to the talent on both sides of the camera given the star-studded cast of Oscar award nominees and recipients from Forest Whitaker to Angela Bassett and Jennifer Hudson combined with music producer Raphael Saadiq, Black Nativity is a lovely if understated musical adaptation. As such, it does in fact owe more to the influence of Carney’s naturalistic Once than the genre razzle dazzle of recent musical theater cinematic interpretations like Dreamgirls, Chicago and Nine. Using Langston Hughes’s own life and legacy to inspire in addition to the landmark nativity play, Lemmons sets out to honor his version of Harlem (wherein he once famously stated he’d rather be a lamppost than the governor of Georgia). Resisting the temptation to set the film in the past, Lemmons compromises with a presentation of contemporary life that’s been heightened with both magical realism and old-fashioned wholesomeness. 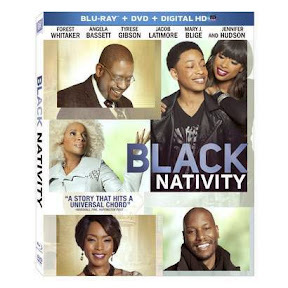 And even though it tackles issues from teen pregnancy to crime, Black Nativity reminds us that while times have changed, the same issues facing pervade regardless of race, class or religion. Rather than opting to go for a straightforward adaptation of the African-American retelling of the birth of Jesus, Lemmons infuses the themes of the storyline in a new narrative as we’re introduced to Jennifer Hudson’s hardworking single mother Naima. 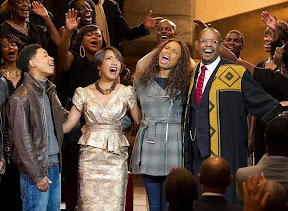 After being evicted and doubling up on jobs and shifts over the Christmas holiday, Naima reluctantly sends her teenage son (aptly named Langston and played by Jacob Latimore) to stay with his estranged grandparents in the form of Whitaker’s proud reverend and Bassett’s supportive wife. Desperate to uncover the truth about his mother’s own relationship with the two who, despite being pillars of their community given their well-attended sermons at Holy Resurrection Church, have never been a part of their daughter and grandson’s life, the angry Langston finds himself in the middle of a family mystery involving his own birth. And while admittedly you can see one key plot twist coming as inevitably Langston crosses paths with his own father (whom he has never met), Lemmons does an admirable job of layering the two interrelated plot strands together so that all of the characters cross paths in a dramatic finale wherein the secrets of the past that are still holding everyone back are finally revealed. Less focused on divine intervention than on delving into the interpersonal relationships of the main cast and empowering her strong characters so that they can finally find peace, Lemmons has succeeded in making a film that champions the power of the human spirit and the importance of love, family and friendship in a way that’s never preachy or heavy-handed. And by walking that fine line, she’s made a much more spiritually inclusive picture that can attract film fans of any (or indeed little) faith, where – like Vinterberg, she places people first while following her own directorial dogma by incorporating the same family-centric themes that first attracted us to Eve’s Bayou with her love of music on display in the DJ-biopic Talk to Me. Weaving in the author’s own quotations while paying tribute to his strong sense of community pride, Kasi Lemmons’s gorgeously lensed holiday work that honors the man who taught us to “hold fast to dreams” moves fast enough for us to forgive some minor musical genre contrivances and a slightly wooden performance from Latimore. And by hitting a chorus of sweet-sounding notes both gospel-based and its cinematic approach where we see reflections of characters in Christmas ornaments and carolers sing “Silent Night,” Black Nativity serves up a slice-of-Harlem-life according the praiseworthy gospel of Lemmons and Hughes.